What is Slip and Fall Law? Slip and fall law refers to the liability rules governing cases in which an individual falls to the ground and suffers harm due to a dangerous condition on someone else's property. As a subset of personal injury law, these cases are controlled by the basic rules of negligence. Unless an accident occurs on federal government property, state law will control. Violations of local building code ordinances can also be relevant. Despite the reference to a "slip," this area of the law covers any accident that results from the victim encountering an unsafe condition underfoot, whether it produces a stumble, overextension, twist, or other movement. Direct causes can include spilled liquids or food, cracked sidewalks, objects on the stairs, ice and snow, broken floor tiles, uneven steps, and potholes. Indirect causes, such as dim lighting or missing handrails, can also contribute. 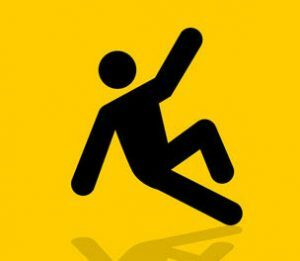 At the outset of a slip and fall lawsuit, the responsible parties must be identified. While fault can usually be traced to an individual employee or tenant who caused the hazard, there will be additional parties who exercised control or ownership of the accident site. These may include the property manager, business owner, landlord, or the owner of the property. In most cases, one or more of these parties will have liability insurance covering the property. If the identity of a responsible party cannot be immediately determined, or if there is uncertainty as to the precise name of one of the defendants, most jurisdictions allow the lawsuit to name a "John Doe" defendant. Once the responsible party has been identified, the court documents can be amended to substitute the correct name in place of John Doe. This allows a plaintiff who is still researching the case to file the claim on time. Special considerations arise when a slip and fall accident takes place on public property. Foremost is the issue of sovereign immunity. Historically, individuals were completely barred from suing the government for negligence. In modern times this rule has been amended by statute, and the government now allows itself to be sued in limited circumstances. If an injury does qualify, victims must also comply with strict notice requirements and time limits. Unless it is a rare case involving intentional conduct by the defendant, a slip and fall case will require the plaintiff to prove negligence. Negligence means that the defendant failed to act in a reasonable manner under the circumstances. For example, it is reasonable to expect a store clerk will place warning signs in recently mopped areas. If this is not done, and a customer slips on the wet floor and gets hurt, the store may be liable for negligence. Whether someone acted negligently will depend on what they knew. This is especially true in slip and fall cases, as the defendant's knowledge of the dangerous condition will usually be determinative. The plaintiff is entitled to find out what the defendant knew through a procedure called discovery. During discovery, the defendant can be forced to turn over maintenance records, repair logs, surveillance video, and other such items. A slip and fall victim is also permitted to gather sworn testimony regarding what happened. The plaintiff does not need to wait until trial to learn what the witnesses will say. This is accomplished by conducting depositions (recorded interviews). Subpoenas can be issued to the defendant and other parties to show up to be deposed at the office of the plaintiff's attorney, and to answer questions about the accident on the record. Cases that initially appear favorable to the plaintiff are often derailed once the plaintiff's own conduct is analyzed. Defendants in slip and fall cases are sure to raise the issue of comparative fault. Also called contributory negligence, the basic idea is that the victim was careless in not avoiding the danger, and shares some or all of the blame. To avoid such a defense, slip and fall victims should retain an attorney before speaking with anyone about the incident.